Glass is an amorphous form of matter. It is a solid. You may have heard different explanations about whether glass should be classified as a solid or as a liquid. Here is a look at the modern answer to this question and the explanation behind it. 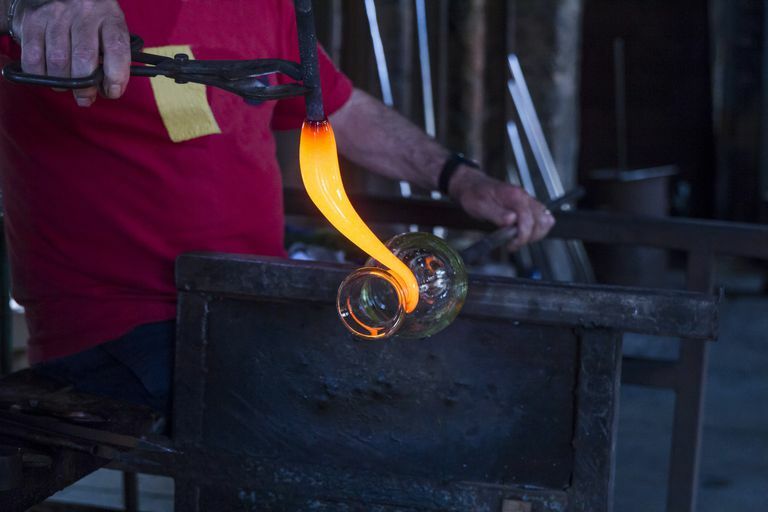 Key Takeaways: Is Glass a Liquid or a Solid? Glass is a solid. It has a definite shape and volume. It does not flow. Specifically, it is an amorphous solid because the silicon dioxide molecules are not packed in a crystal lattice. The reason people thought glass might be a liquid was because old glass windows were thicker at the bottom than at the top. The glass was thicker some places than others because of the way it was made. It was installed with the thicker part at the bottom because it was more stable. If you want to get technical, glass can be a liquid when it is heated until it is melted. However, at room temperature and pressure, it cools into a solid. Consider the characteristics of liquids and solids. Liquids have a definite volume, but they take the shape of their container. A solid has a fixed shape as well as fixed volume. So, for the glass to be a liquid it would need to be able to change its shape or flow. Does glass flow? No, it does not! Probably the idea that glass is a liquid came from observing old window glass, which is thicker at the bottom than at the top. This gives the appearance that gravity may have caused the glass to slowly flow. However, glass does not flow over time! Older glass has variations in thickness because of the way that it was made. Glass that was blown will lack uniformity because the air bubble used to thin out the glass does not expand evenly through the initial glass ball. Glass that was spun when hot also lacks uniform thickness because the initial glass ball is not a perfect sphere and does not rotate with perfect precision. Glass the was poured when molten is thicker at one end and thinner at the other because the glass started to cool during the pouring process. It makes sense that the thicker glass would either form at the bottom of a plate or would be oriented this way, in order to make the glass as stable as possible. Modern glass is produced in such a way that has an even thickness. When you look at modern glass windows, you never see the glass become thicker at the bottom. It is possible to measure any change in the thickness of the glass using laser techniques; such changes have not been observed. The flat glass that is used in modern windows is produced using the float glass process. Molten glass floats on a bath of molten tin. Pressurized nitrogen is applied to the top of the glass so that it acquires a mirror-smooth finish. When the cooled glass is placed upright it has and maintains a uniform thickness across its entire surface. Although glass does not flow like a liquid, it never attains a crystalline structure that many people associate with a solid. However, you know of many solids that are not crystalline! Examples include a block of wood, a piece of coal and a brick. Most glass consists of silicon dioxide, which actually does form a crystal under the right conditions. You know this crystal as quartz. In physics, a glass is defined to be any solid that is formed by rapid melt quenching. Therefore, glass is solid by definition. Why Would Glass Be a Liquid? Glass lacks a first order phase transition, which means it does not have a volume, entropy, and enthalpy throughout the glass transition range. This sets glass apart from typical solids, such that it resembles a liquid in this respect. The atomic structure of glass is similar to that of a supercooled liquid. Glass behaves like a solid when it is cooled below its glass transition temperature. In both glass and crystal, the translational and rotational motion is fixed. A vibrational degree of freedom remains. What Are Some Different Types of Solids, Liquids, and Gases? What Is Glass Transition Temperature? What State of Matter Is Fire or Flame?